There are already plenty of reasons to visit the Saturday farmers market in Irvine, where manager Trish Harrison stacks in some of my favorite vendors. There are the Cal Poly Pomona students whose stuff tastes so great, salad supplier to restaurant stars Scarborough Farms, and Stehly Organics from Valley Center. Now I’ve got another good one: Koda Farms, whose organic, heirloom Kokuho Rose Japanese-style rice is grown in the Central Valley on the oldest rice farm in California. It’s pricey—I paid $33 for a 10-pound bag of white—and I’ll have to see if I agree with the connoisseurs who say it’s worth it. Koda also sells an organic brown version. I love rice, and am glad to try one grown and marketed with such pride—take a moment to read the history of the farm on the company website. I have to get going on just the right Japanese menu, and fire up the old Zojirushi. 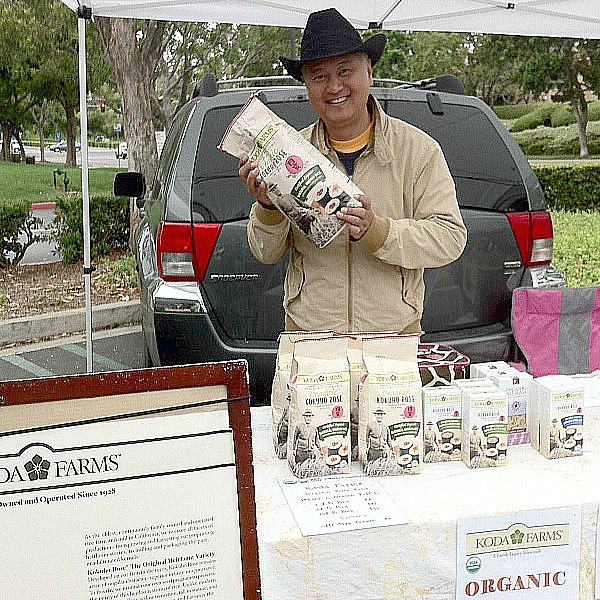 And if you miss the Irvine Saturday market (it opens at 8 a.m. and closes at noon sharp), you’ve got a second chance—Koda Farms also sells at the Thursday market Harrison manages at the fairgrounds in Costa Mesa.